Miami police arrested 56 government employees yesterday, on charges relating to a grand-scale insurance fraud to obtain prescriptions for the highly addictive painkiller OxyContin. OxyContin is a frequently abused prescription drug that delivers an instant high when ingested. An estimated 130 fraudulent prescriptions were used to obtain more than 12,000 tablets of OxyContin, with a street value of $400,000. According to prosecutors the illegal operation began in 2003, when employees of local government were recruited by 6 initial members to provide their health insurance information. With that information they obtained medically unnecessary prescriptions for OxyContin from a physician who has also been arrested. The defendants include two corrections officers, a felony court clerk, a police officer, and 27 school bus drivers and attendants, according to the Miami-Dade state attorney's office. 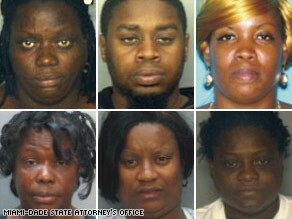 They all face charges including racketeering, conspiracy to commit racketeering and grand theft.